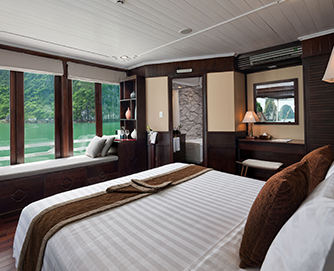 Elegant Pelican Cruise Concept with luxury facilities. 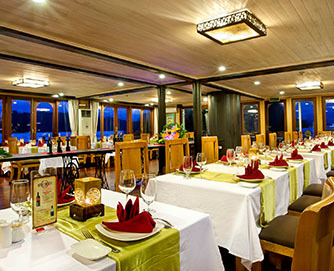 We enjoyed a two night cruise with Pelican Cruise as a group of six, in three cabins. We were picked up by a good driver in a wifi equipped luxury van in Hanoi and taken to Pelican Cruise lounge in Cat Ba, from here we were shuttled to the launch and then welcomed on board the cruise ship. It was a warm welcome and included being showered with rose pedals- a bit over the top, but it would be nice if you were on your honeymoon! 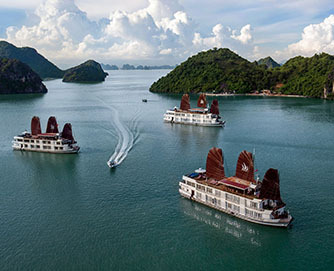 We travelled to Hanoi in a group with my three girl friends, then cruised along Halong Bay with Pelican Cruise for 3 days and 2 nights. It was an amazing experience from the minute we were picked up from our Hanoi hotel until the end of the cruise trip! Hospitality of crew are superb, cabin rooms are clean and comfortable and best of all- the meals! We were spoilt silly with amazingly delicious food!